Starting with the vision of mindware as software and debates between realists, instrumentalists, and eliminativists, Andy Clark takes students on a no-holds-barred journey through connectionism, dynamical systems, and real-world robotics before moving on to the frontiers of cognitive technologies, enactivism, predictive coding, and the extended mind. Throughout, he highlights challenging issues in an effort to engage students in active debate. Each chapter opens with a brief sketch of a major research tradition or perspective, followed by concise critical discussions dealing with key topics and problems. 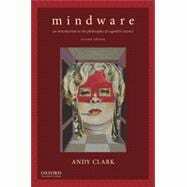 Andy Clark is Professor of Logic and Metaphysics in the School of Philosophy, Psychology, and Language Sciences at the University of Edinburgh. He is the author of six books including Supersizing the Mind (2008) and Natural-Born Cyborgs (2004), both published by Oxford University Press.